Chocolate Chip Banana Bars are a simple & delicious ripe banana recipe that’s even better than banana bread! Great for breakfast, lunch and even dessert! 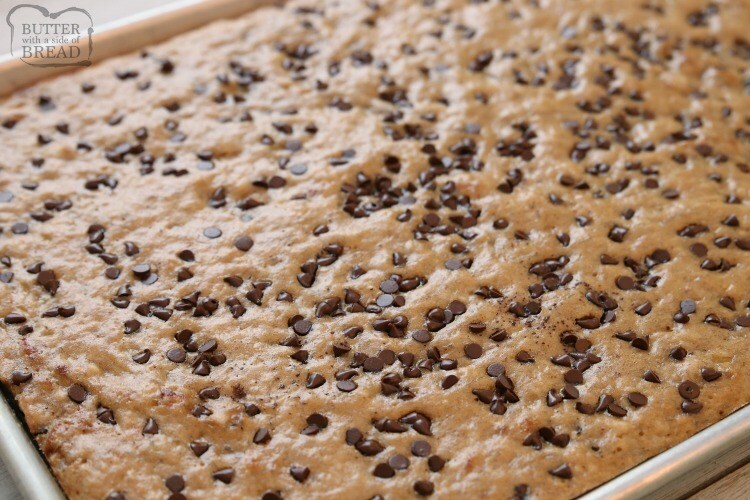 Check out all the 5 star reviews- everyone raves about these Chocolate Chip Banana Bars! 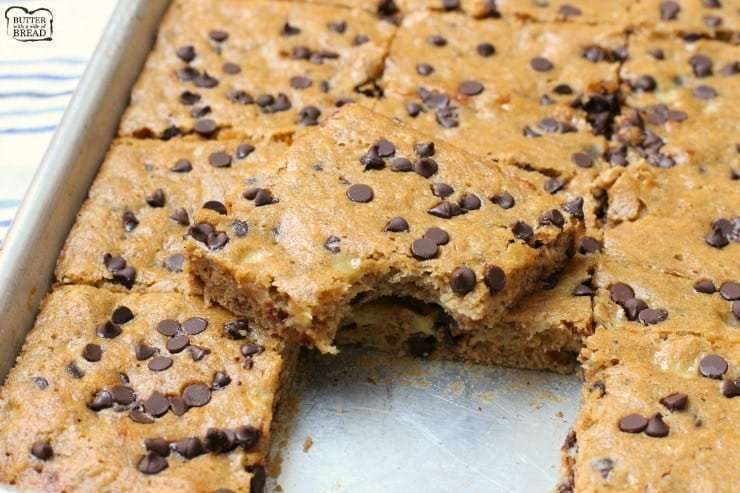 This recipe for Chocolate Chip Banana Bars is my favorite banana recipe ever. 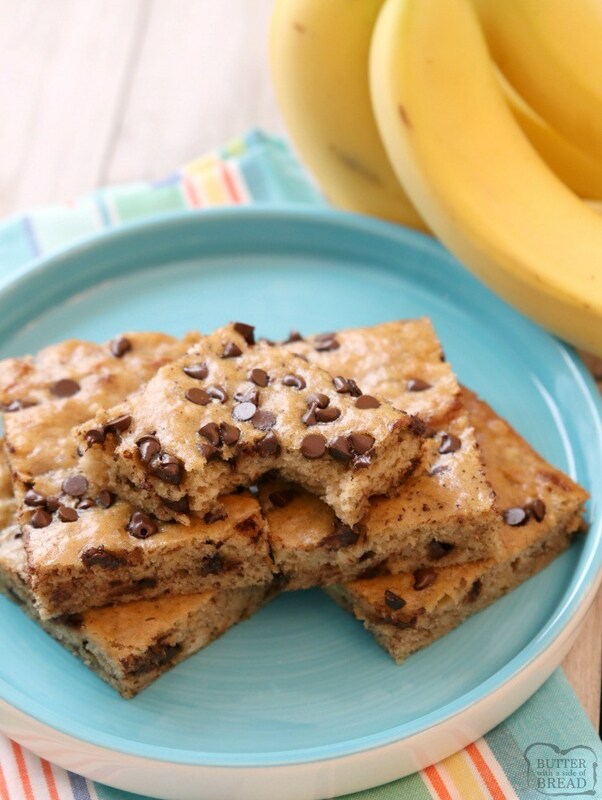 Chocolate Chip Banana Bars are perfect for breakfast, lunch, or a snack! They are delicious, filling, and your whole family will love them. I love that they have a ton of bananas in them. I like to bake a batch, cut them into squares and freeze them individually for when we’re on-the-go! I’ve made these tasty treats for years and our family can’t get enough! They’re perfect for a snack, but I also like to eat them for breakfast. They’re chock full of bananas and I use whole wheat flour to make them more filling. I know the addition of cinnamon may seem a little different, but I encourage you to try it. It adds just a nice pop of flavor. I’ve recently made a couple variations on this recipe! You’ve got to try our Double Chocolate Banana Bars as well as our Peanut Butter Banana Bars. –I use brown sugar instead of regular granulated sugar to add more sweetness with less sugar. That being said, you can decrease the sugar to 1/2 cup. Just make sure you’re using VERY ripe bananas to add sweetness there. –You can replace half or all of the oil with applesauce. I’m more of a fan of using half coconut oil and half applesauce, personally. –Swap out regular flour with almond flour. Just add a rounded teaspoon of baking soda instead. 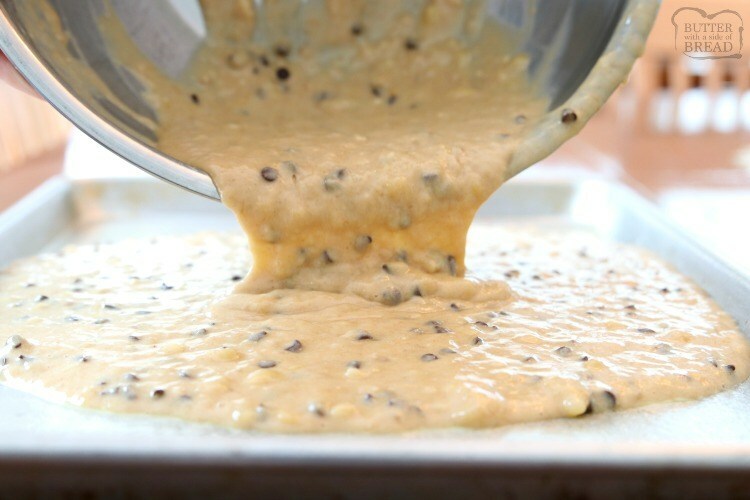 –Add in 2-3 TBSP of ground flax! No one will notice and it gives an added boost of fiber. –Check out my double chocolate version of this recipe. I added cocoa powder and tons of ground spinach. No one can taste the difference and if you blend the spinach small enough (blending it with the coconut oil helps) you can’t see the difference either. How can I ripen bananas quickly? Ripen bananas in the oven. Heat the oven to 350 degrees F and line a baking sheet with parchment paper. Place bananas peel and all on the parchment and bake for 30-40 minutes, until peels are black & shiny. Let cool 1 hour and proceed with banana bread recipe. Ripen bananas in a paper bag. If you have more time, place bananas in a paper bag with an apple. Fold and secure closed. I usually leave bananas like this for a full day, then proceed with the Banana Nut Bread recipe. –5 very ripe bananas (about 1 2/3 cup) – yes, you can use frozen bananas! Once you’re ready to use the frozen bananas, thaw them out slightly, then peel them and place the bananas in a bowl. Once they’re fully thawed, drain out the liquid and proceed with the recipe. Heat oven to 350 degrees F. Spray a 15×10.5″ pan with non-stick spray. Peel bananas and mash well. Stir in brown sugar, oil, milk and eggs until combined. Add in dry ingredients and stir. Fold in 1/2 the chocolate chips. Spread the batter into the prepared pan and sprinkle remaining chips on top. Bake 18-22 minutes, until a wooden toothpick inserted in center comes out clean. Yields 24 bars. Scroll down for PRINTABLE RECIPE. I like to make a batch, then cool, cut and freeze in individual baggies. Since they’re filling, they make a wonderful snack, breakfast or school lunch addition. Chocolate Chip Banana Bars are a simple & delicious ripe banana recipe that's even better than banana bread! Great for breakfast, lunch and even dessert! 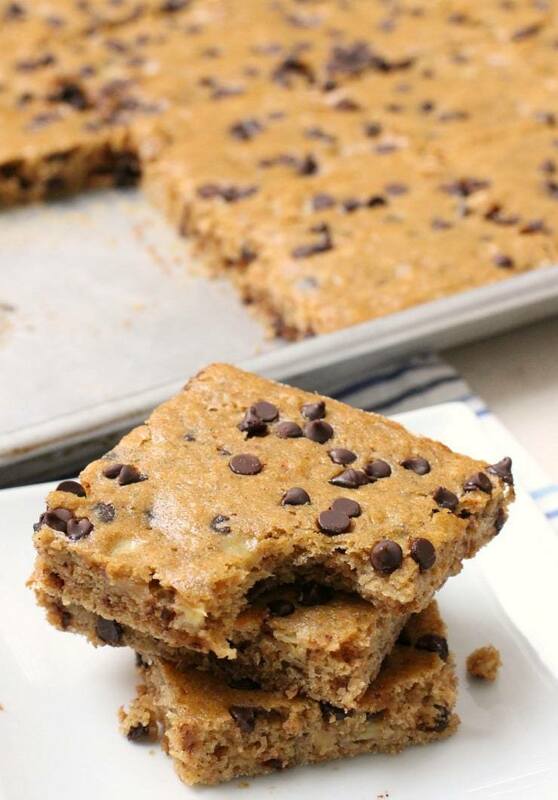 Check out all the 5 star reviews- everyone raves about these Chocolate Chip Banana Bars! Heat oven to 350 degrees F. Spray a 15×10.5? pan with non-stick spray. Peel bananas and mash well. 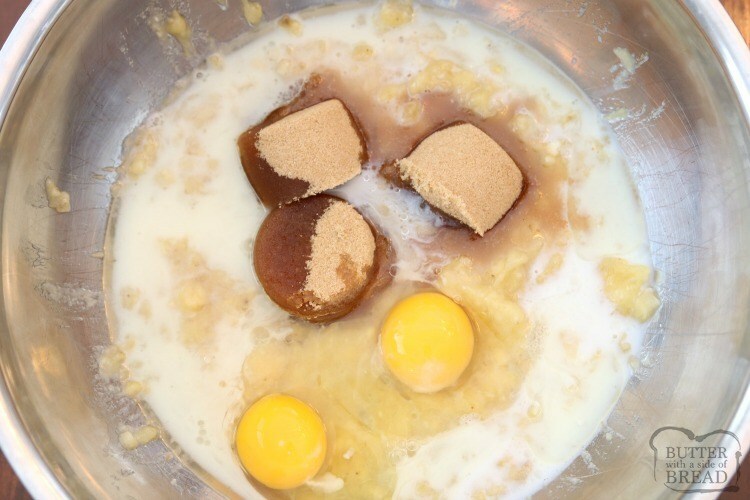 Stir in brown sugar, oil, milk and eggs until combined. Add in dry ingredients and stir. Fold in 1/2 the chocolate chips. Spread the batter into the prepared pan and sprinkle remaining chips on top. Bake 18-22 minutes, until a wooden toothpick inserted in center comes out clean. Cool completely and cut into squares. Can you use frozen bananas in banana bars? A lot of people freeze over ripe bananas to use them later on in banana bars. It’s a simple way to amass a collection of ripe bananas to use in this recipe. you don’t even have to peel the bananas prior to freezing! Once you’re ready to use them in this banana bars recipe, thaw them out slightly, then peel them and place the bananas in a bowl. Once they’re fully thawed, drain out the liquid and proceed with the recipe. Chocolate Chip Banana Bars are a simple & delicious banana bar recipe that's even better than banana bread! Made with 5 ripe bananas, they're the perfect banana recipe. Great for breakfast, lunch and snacks in between. 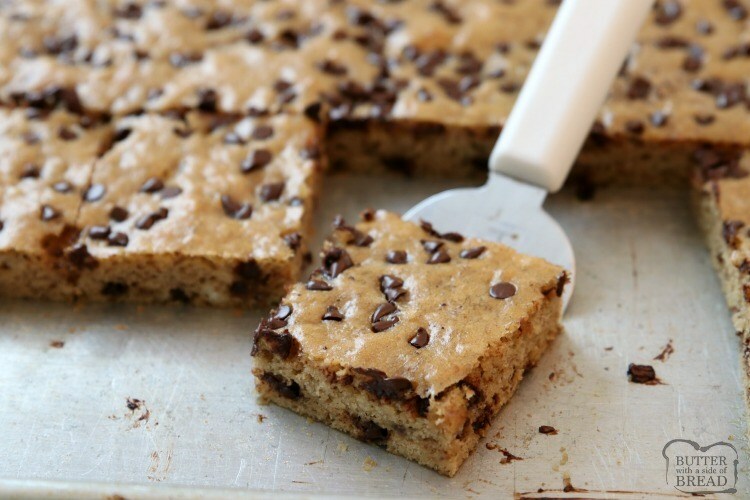 Check out all the 5 star reviews- everyone raves about these Chocolate Chip Banana Bars! 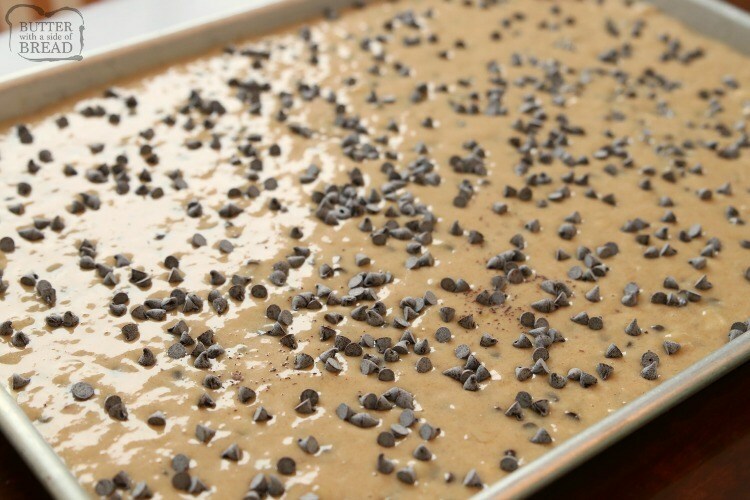 Can you freeze Chocolate Chip Banana Bars? Yes! I freeze these banana bars often! My favorite way to freeze them is to cut them into 2″-3″ squares and place in a small baggie. Place all of the individual baggies in a larger ziplock bag and freeze for up to 2 months. 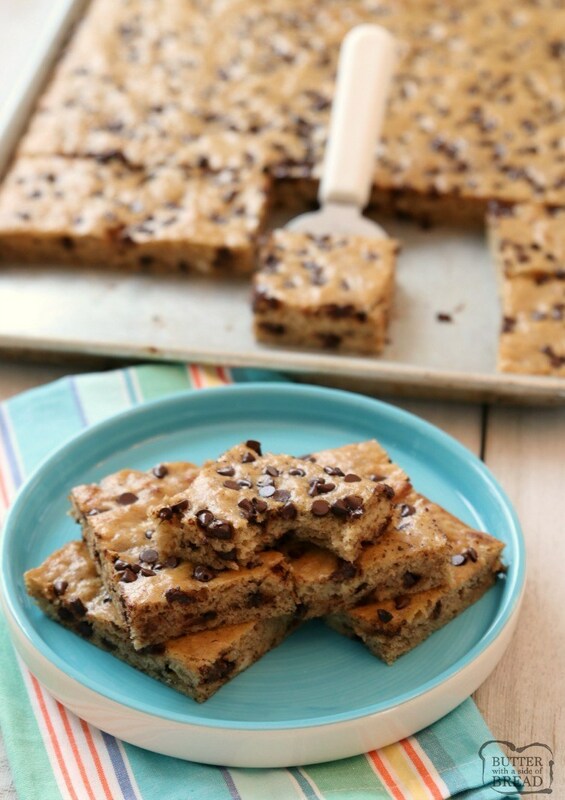 Then you have individual servings of chocolate chip banana bars that are perfect for an on-the-go snack or school lunch! You can also freeze a half pan of these banana bars. 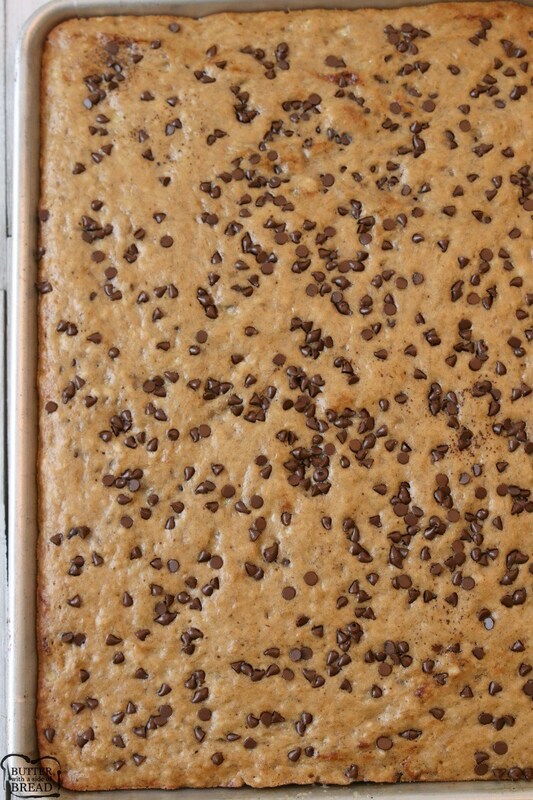 Instead of baking in a 10×15 pan, bake them in 2 quarter bakers sheets or 9×13 pans. Simply cool fully, then cover with plastic wrap and freeze for up to 2 weeks. Are banana bars gluten free?